I super love these sweet Pure Innocence images from MFT. This cute little one was perfect for the weather around here! –5 degrees C or 23 degrees F. Yuck!! The colours are actually a bit deeper IRL; the photo is somewhat overexposed. I tried to adjust the exposure but the detail was blown out. (That means the pixels simply weren’t captured so they can’t be brought out by adjusting the photo digitally.) Grrr! Which means it is hard to see the embossing within the scallops of this EK Success punch. And I totally goofed again, notice I forgot to colour her hair! I was rushing but I did have a few seconds to colour her hair, poor thing! One other thing, the Liquid Appliqué wasn’t dry enough to heat it, so it isn’t as puffy as it will end up. In case you can tell, I covered the BG coloured areas on the design with W-1 to deepen the shade because they were too bright to match the paper. A great technique I learned from Debbie Olson; thanks Debbie! 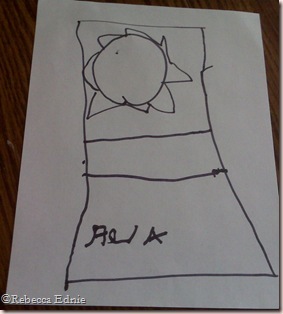 It seems this week we have a sweet sketch from the littlest Diedrich, Ava! I thought this was a great sketch and I had fun playing with it. In fact, I had TOO many ideas! Yeah Ava! I hope you will all welcome a new Team member, Sara Henton! I am DYING to see her project this week! But as I tend to get up a bit late, you will all get there first right? Because you are all going to visit all the DareDevils blogs to see their takes on the sketch right? Be sure to visit the Whimsical Wednesdays blog and leave some love for Sara, leave DIRECT links to your creations AND see who won the AWESOME FREE Unity stamps Jessica offered last week! Thanks Jess! Be sure to use DDSC22 when uploading to an online gallery. Please note: Jacquie N, Kris and Darla (or was it Debbie?? umm…) won’t be playing this week. Paper: Jolly by Golly, vanilla CS-SU! Very pretty! That snowman and Pure Innocence girlie are adorable stamps! that is a really good trick to know! i love this card bec! SO cute Rebecca! Love how you used the sketch! 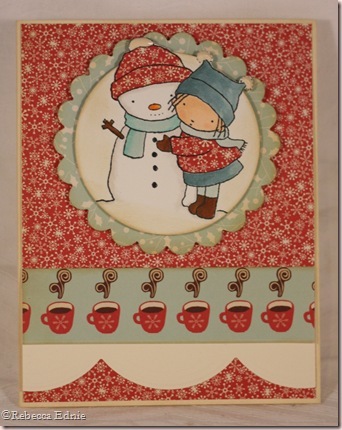 The embossed snow on the scalloped punch is beautiful!